The gate of the campsite is open from 7 am and closed after 11 pm - after this time you must leave your car outside. 8:30am - 12 am and 5pm - 7pm in low season. Arrival after 2pm and departure before 12am. Arrival after 3pm and departure before 10am. 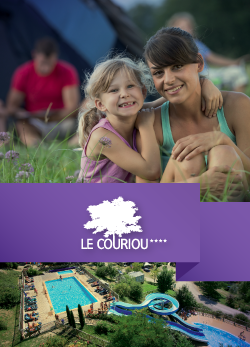 The Couriou campsite has a surface area of 13 hectares, with 160 places of which 52 are mobilhomes. After 10 pm noise level must be lowered and has to stop completely after 12 pm. All common places like sanitary, playground etc must be used reasonably and with respect for the security rules. Visitors must always present themselves at the reception and pay a daily ticket (cars and animals of the visitors are not accepted in the campsite). Rubbish bins are situated next to the gate, at the entrance of the campsite. Open fire is forbidden in all campsites of our region, that's why only electric and gas barbecues are permitted. Shorts are strictly forbidden in the swimming pool. All parents must constantly watch their children, after 12 pm no child has to be alone in common area of the campsite. All people riding bikes in the campsite must pay attention on cars and stop riding at night time. The dogs of categories 1 and 2 are not admitted. The vaccination certificate of your animal has to be up to date and presented during your arrival. Only one animal per pitch or rental is accepted. Dogs must be necessarily kept on a lead and trailed round outside of the campsite. Animals are not accepted in the common spaces, such as toilet blocks or playground for the children. In bungalows and mobilhomes it's forbidden for animals to stay on beds.